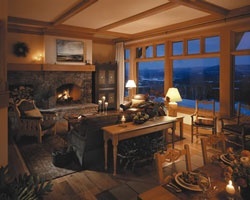 Tucked away on 61 secluded acres, the *Villas at Trapp Family Lodge* offer unparalleled elegance and comfort in a tranquil setting high above the mountain valley. 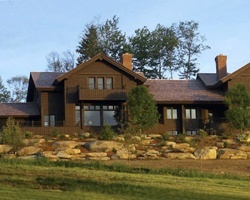 Pitched gable cedar roofs and second floor balconies are reminiscent of the original Trapp Family Lodge. Inside, the soaring ceilings, exposed beams, light-suffused rooms and hard wood floor rooms evoke the sophistication of a European villa and the magic of a Vermont retreat. Inviting furniture, exquisite fixtures and accessories, and extraordinary attention to detail blend in effortless harmony. The private Villas seem to unfold into nature. Elegant yet rustic mountain retreat! 4 weeks every year in desirable July 4th week, September week & floating wks! Mountain view unit! Make an offer! Gold, Silver and Bronze season weeks. Extremely rare resale opportunity!